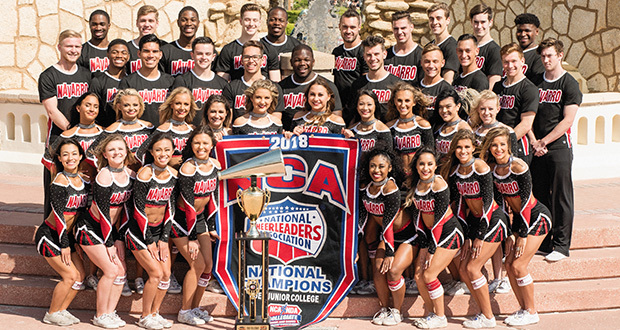 Last week marked a victory for the Navarro College Cheerleaders, as they managed to reclaim the National Cheerleaders Association National Title. To celebrate, the college will host a community celebration party at 1 p.m. on Wednesday, April 18, at the Corsicana Campus. What? : Navarro College Cheer Celebration. When? : 1p.m. Wednesday, April 18. Where? : Corsicana Navarro College Campus, courtyard by the clock tower. The cheerleaders competed at the NCA & NDA Collegiate Cheer and Dance Championship held on the week of April 3-7 in Daytona Beach, Florida. It was at this competition that the team reclaimed the National Title, marking their 13th time to win the Title. The team also won Grand National Champion for the fifth time, for having the highest score of all the teams competing, including four bigger universities. Everyone is welcome to come join their celebration, no fee required. The Navarro College Cheerleaders won the National Title and Grand National Champion at NCA College Nationals 2018. Courtesy photo/Jerry Hughes.